Again, my friends came to the rescue. Another not so great week made better by dear friends. You see, one of my most favorite things to do is send mail. I love stationary, care packages, ribbon, stickers and such. I also LOVE to send care packages. This week, I was the lucky one, with happy mail in my mailbox. 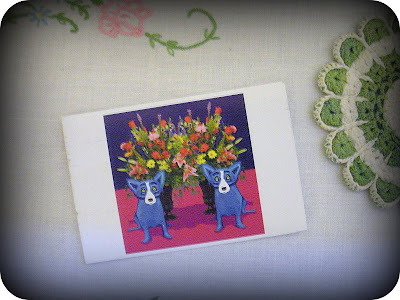 My beautiful friend April sent me this "Blue Dog" postcard. George Rodrigue and his "Blue Dogs" remind me of my time living in the South. That special time when I made lovely friends. Friends like April whom I miss terribly. I LOVE those blue dogs. 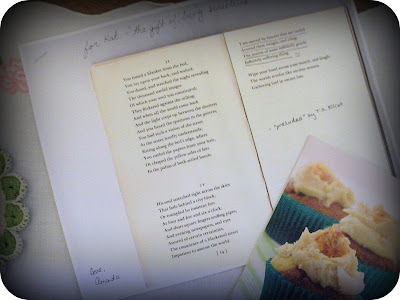 Then I received a very special package from dear Amanda. I like to call it a "sensitivity package". I needed it so very much. She included a very special Tennessee Williams story that she shared recently on her blog. I think I will frame the little doodle she drew in the card. I can't wait to make the apple cinnamon cupcakes. That's right, she sent a recipe too. MAKE A FRIEND FEEL LOVED TODAY. i ADORE all your happy mail.